The Bureau of Meteorology has released its ‘first look’ monthly and seasonal Climate Outlooks for May to July 2018, which point to wetter than average conditions for Tasmania and eastern Victoria extending into southeast NSW. Parts of northern Australia are also likely to be wetter, however, rainfall during the start of the northern Australian dry season (May-September) is typically low, meaning little rainfall is needed to exceed the median. Elsewhere, the chances of a wetter or drier season are roughly equal. 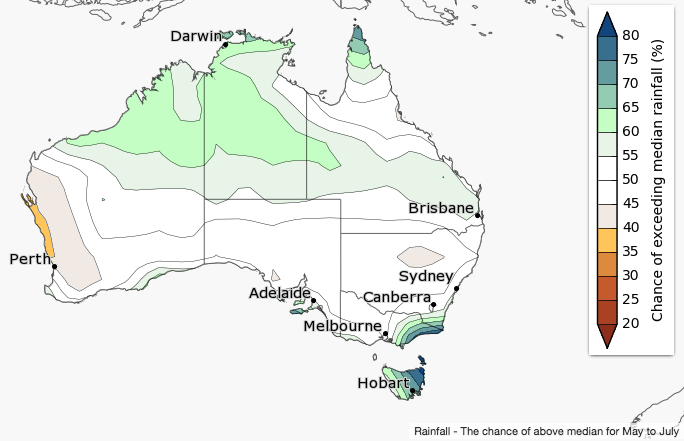 Historical outlook accuracy for May to July rainfall is moderate over western and southern WA, the southern NT, southeast SA and large parts of the eastern States. Minimum temperature outlook. Click on maps to enlarge. 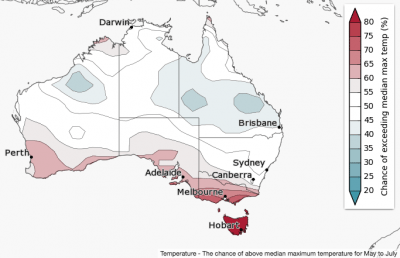 May to July daytime temperatures are likely to be warmer than average for southern Australia, including southwest WA, southern SA, Victoria and Tasmania. Chances are highest (greater than 80pc) in Tasmania. 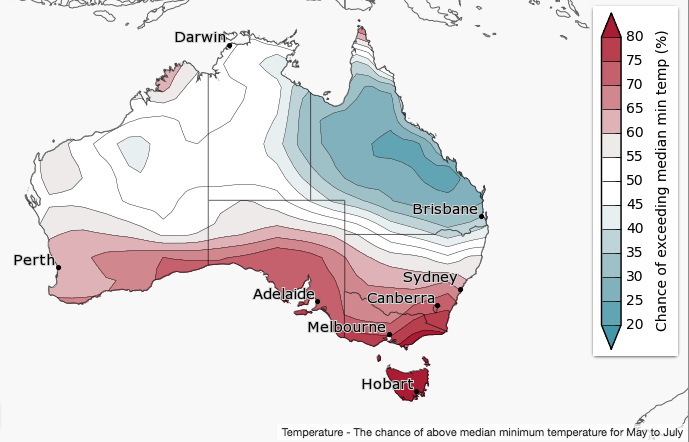 Night-time temperatures are likely to be warmer than average for southern Australia while Queensland is likely to have cooler than average nights. May days and nights are likely to be warmer for much of the country. Historical accuracy for maximum temperatures is moderate to high over most of Australia for May to July. Minimum temperature accuracy is also moderate to high for most of Australia, except parts of southern WA and most of southeast mainland Australia where accuracy is moderate to low.